In my post about Miyazaki’s pacing, I focused on the balance of fast and slow, but alluded to greater nuance in moments and feelings. Do you remember Scott Westerfeld’s “pace chart”, from my very first post? ACTION means fighting, pursuit, or any other sort of physical peril. Tension means sneaking, arguing, or the revelation of horrible facts. “nothing” means mostly conversation, exposition, and looking at stuff that may be wonderful, but isn’t threatening. The new kind of beat here is tension, which we might have otherwise described as a “slow moment.” It’s true that if you just look at what’s happening, a “tension” beat looks slow. When you’re immersed in the story however, the moments are pins and needles. I’d argue that a scene of somebody drinking coffee could be a “tension” beat, as long as the audience has somewhere else they want to be. For example, drinking coffee, boring. Watching somebody drink coffee when we know that any second a bomb will go off, TENSION! Alfred Hitchcock has a famous quote on the issue. Alfred Hitchcock was a master of “slow” pacing. I have my own ideas about suspense, but the focus for this article is the way young-adult novels often use emotional swings as a pacing tool. First I’ll give two common cycles, then explain how and why they work. There’s an improv (theatre sports?) game I like where emotions are assigned to different areas of the stage. The actors naturally begin to move through these areas in patterns that make a story, pushing themselves through obstacles and often ending in the “positive” space–whatever’s given: love, hope, joy, optimism, etc. 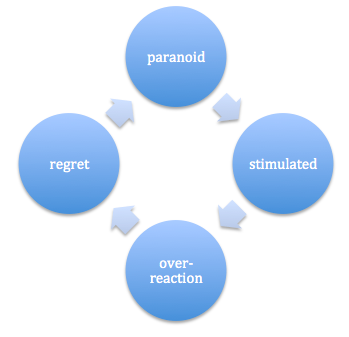 The YA Emotion Cycles above are similar. We have one positive, and three kind of negative/in-betweenies. They function similar to Westerfeld’s pace chart with feelings of tension (paranoia, longing, wondering, etc) leading to moments of action and release (over-reactions and romantic bliss). 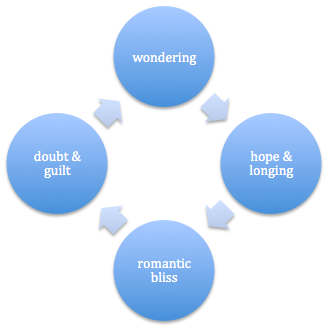 Looking at the emotions involved in the cycles, it’s clear how they’re connected and how they fit with teenagers’ experiences. What teenager isn’t paranoid and wondering about something? What teenager never over-reacts? While the stakes in the average teenager’s life may seem low to adults on the outside, that’s just another reason why the teenage experience is so intense. It feels like nobody understands. In young-adult novels, the rest of the world often actually doesn’t. The Hunger Games uses both cycles repeatedly. It’s heightened and justified by Katniss’s predicament. She has some denied feelings for Peeta, then kisses him, then feels bad about Gale, then starts to wonder again whether Peeta was acting. She is paranoid that everyone is out to get her, furiously shoots an arrow at the gamekeepers when they ignore her, then regrets her action, sure that now she’s doomed. And on and on the cycle turns. Teenagers’ experience the world in a way that is already built like a roller coaster. It’s unsurprising that fiction depicting their experience has caught on and become mainstream. I’m nearing endgame for the novel I’m writing, so I’m going on hiatus from blog posts. I will be back in July. See you then!